Do you want to make your lifestyle more green? 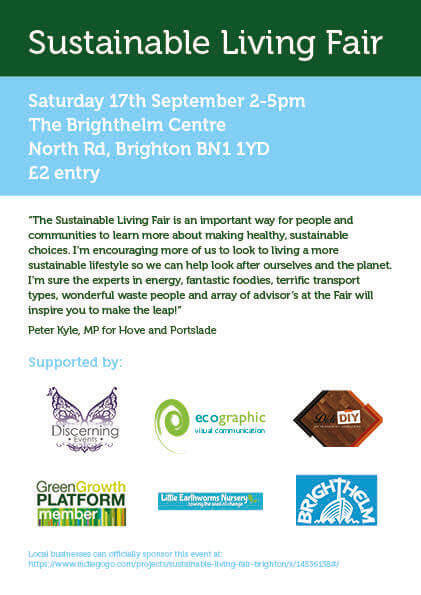 If so, the upcoming Sustainable Living Fair here in Brighton is one for your diary. A fun and educational afternoon event, the fair will be held on Saturday 17th September 2016 from 2-5pm, at the Brighthelm Centre. It’s organised by Discerning Events, a local events company. We’ll have a stall at the fair and will also be giving a talk. We’ll be participating in the fair with an information stall about sustainable architecture and one of our architects, Issi Rousseva, will also be giving a talk about refurbishing your home with natural materials and energy efficiency technologies. Green refurbishments can save you lots of money on heating and electricity, cut your carbon footprint and make your home more comfortable. Whether, you’re planning a project (refurbishment, remodel, extension, new build…) of if you’re just curious and want to learn more, come and chat to us! Another great thing about this event is tickets only cost £2. You can sign up on Facebook if you like, but you need to pay on the door. If you run a local business, or are a speaker or performer, you can also get involved by having a stall, giving a talk, running a workshop, offering a prize for the raffle or giving a performance. Contact the organiser, Jo Dickens of Discerning Events, on 07814736486 or email jo.dickens@discerningevents.co.uk. Get green architecture news & design ideas in your inbox!